Last month I undertook my first 5 day water fast. It is turned out to be a really helpful tool for my health and productivity, so I committed to make it a monthly ritual for 12 months. With each month the plan was to push the edge a bit to learn more from the experience – refining the approach to the fast with the different options available and tracking the results to see what could give me the biggest payoff for least effort. Enter the “Fast Mimicking Diet” – an easier and safer way to get the same benefits as pure water fasting. It created a spark of media coverage around it following the publication of a new research paper on it in June 2015. Two of the articles actually had two journalists become fast mimicking diet guinea pigs for 5 days (Peter Bowes at the BBC, and Victoria Lambert at The Telegraph). It’s clear to me that most people will never do a water fast because it looks like a psychological feat fit only for diet equivalent of extreme sports fanatics. So the Fast Mimicking Diet was an obvious choice for fasting experiment #2. If it does make the fast much easier – I just might be able to persuade some more of you to take the jump and grab some of those upside benefits for yourself. 1 What is the Fast Mimicking Diet? 3.2 Does the Fast Mimicking Diet = Lean Gains? What is the Fast Mimicking Diet? The exact details of what the Fast Mimicking Diet is in terms of food breakdown aren’t available publicly. Which in part, can be explained by the fact that the main researcher behind the fast mimicking diet, Valter Longo, owns a patent on the FMD (published January 2015) and a company which has designed a comprehensive packaged FMD dietary product ProLon. For our purposes though there is enough information available to put together our own version of it. The Fast Mimicking Diet I used and the other versions below, are based on some very specific FMD design points found in Longo’s January 2015 patent and the June 2015 study (the macro and micronutrient do’s and don’ts). For the nutrition geeks out there I’m sure you’re already thinking up some Fast mimicking diet recipes to play with. For most of us though, this sounds pretty much like techno-babble… Don’t worry though, there’s a much easier way to look at the FMD. It turns out that days 2 to 5 are pretty much equal in calorie intake and macronutrient ratios to just 2 normal sized avocados (based on NutritionData numbers here). That’s one avocado for breakfast. One avocado for dinner. Done. For simplicity sake, you can just run all 5 days that way. (Note: Sizes of Avocados vary depending on origin. 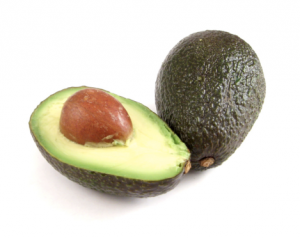 Florida origin avocados are larger, and California origin smaller for example. If you’re using the smaller variety, it will be 3 avocados per day). Then you need to take care of the micronutrients. For that you take 4 tablespoons of broad spectrum greens powder (a supplement made from dehydrated vegetables). So your day ends up looking like this. That takes all of the thought out of it. Note: For those who are more ambitious, Josh Mitteldorf has posted some FMD recipes that you can put together. My personal goal for this experiment was to emphasize regeneration of the immune system – and I’m impatient about it. So I used a reduced FMD this time to ensure that I was giving my body as strong as possible starvation signal, while supporting its processes. For this reasons I cut out the macronutrient intake (the avocados) and only went with the 4 tablespoons per day of greens powder (micronutrient intake). So the experiment results you’ll see below are from a modified FMD – just the micronutrient intake. In the study they tracked their post intervention results after 3 cycles of FMD. I would only be doing it after 1 cycle. For this reason the results could be expected in my case to be less significant – that would be the assumption, however it’s not what happened. My metabolism switched from glucose to ketones one day earlier than in my first 5 day fast. Like last time the fast “felt easier” once I’d switched from glucose to ketone metabolism. So by the afternoon of day 2 of the fast the hunger pangs or discomfort had pretty much gone. At their peak, my ketones were just a little higher than last time at 7.3 mmol/L. This was 29 times my baseline, which is a lot higher than the average 9 times above baseline noted in Longo’s Fast Mimicking Diet study. We have an interview with another guest coming up in the next weeks discussing the importance of this variation in ketones (higher variation = better). My blood glucose dipped a little lower this time also settling in at a consistent 57.5mg/dL in the fasted state. This is 64% below my baseline vs. an average 40% below baseline from the study. I continued to track ketones and glucose after the fast ended at the 120 hour mark (end of 5 days). So it’s interesting to note that it took my body 2 days to really switch back out of ketone to my normal metabolism once the fast was ended. Looking at Seyfried’s Glucose-Ketone Index (GKI) (from episode 16) the fast was shown to be more effective this time round. In the chart below you see #1 Water Fast compared to #2 Fast Mimicking Diet. In this 2nd fast my body spent 18 hours longer in Seyfried’s therapeutic zone for cancer (lower than an index of 1) than in the first. 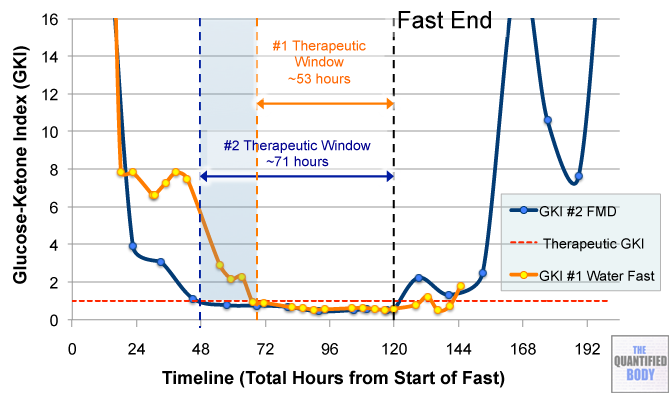 That extended the therapeutic window to 71 hours – an impressive total of nearly 3 days. My assumption here is that it’s the fact that this is my 2nd fast that my body switched to ketone metabolism quicker this second time. It’s a pretty significant change compared to my first fast, so unlikely to be just variance. It’s possible that my version of the FMD somehow supported this also – but my bet would be that its my body having learned to adapt to the fasted state quicker. Future fasts will provide more insight around this. Does the Fast Mimicking Diet = Lean Gains? In my last fast I ended up being concerned that I’d lose weight every fasting cycle and if repeated monthly eventually ending up a skinny strawstick version of myself. More concerning, I was wondering if it was lean muscle mass that I was losing. This time round I had the BodPod to control whether it was lean mass or body fat I was gaining or losing. In addition, the FMD study shows a slight lean mass gain on average for people doing cycles of FMD. Although mine was a minor version I was hoping to avoid a decline in weight as with last time. Using my Omron scales there was a 1.7kg (3.7lb) from baseline to day 7 after the end of the fast (day 12). The BodPod results were even more promising. 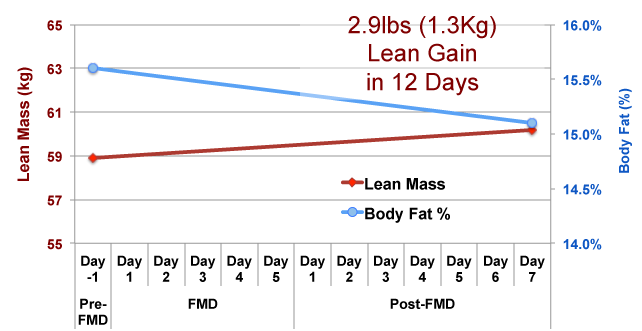 It turned out that I had gained nearly 3lbs (1.3kg) of lean mass over the 12 days. The body fat change was negligible. Note: You’ll notice that the Omron scales and weighing scales used with the BodPod did not agree. A reminder of the importance of using the same device to track whenever possible due to inter-device variances. The BodPod is the more accurate. And we come to the last but in my opinion most important item. Did the biomarkers show an indication that my body and immune system had regenerated as has been shown in Longo’s study? The IGF-1 results are promising. There was a nice drop of IGF-1 44% below baseline. This compares with an average of 22% reported in the study. The BBC journalist Peter Jones, one of the study’s participants, had a drop of 60%. The hope was to see a significant drop and recovery of IGF-1 like this as it correlates with the gene signaling required for regeneration. Also of note my baseline IGF-1 levels hover between 115 and 120 ng/mL – these are below the typical reference range for my age (132-333 ng/mL) likely due to my long term ketogenic dieting (~7 years with different variations at this point). The bigger interest for me was the immune system of course. The results here were a little disappointing – very hard to judge if anything happened. In the study they noted bigger changes in one class of white blood cells: Lymphocytes. This held true in my results with a larger % drop from baseline compared to all white blood cells. Anecdotally, the situation is personally clearer for me. As with my first fast I had a period of a week after the fast where flu-like symptoms and fatigue taxed me. With this 2nd fast it lasted a little longer, extending to between one and a half and two weeks. Since that time I’ve noticed once again a bump up in my perceived wellness. Less fatigue. More energy. Less symptoms in general from the lyme and babesiosis infections I’ve documented (see the complete story behind these in the last experiment intro). So, again, the fast has been worth it for me. Fasting is known to stress the adrenals, and for me personally this is a particular concern, since I already have documented low adrenal function. To continue my monthly fasting cycles I decided I would have to see improvement in my adrenal function compared to a baseline I established last November 2014. Having been on treatment since March 2015 to support recovery of the adrenals I would have expected some progress. However, I felt that the fast may counteract that progress potentially. Or exacerbate it. This may or may not have been the case. However, the results of my adrenal functional profile show continued deficiency compared to the low normal reference range. While the fast has in my opinion lived up to the studies in terms of reseting and regenerating my immune system to some extent – it’s probably also true that it has not helped my adrenal recovery. It wouldn’t be wise (or responsible) to continue this cyclic fast given this downside. I’ve discussed what in my opinion are the most likely takeaways from the results so far. However, there are other possible explanations. These are the potential biases that I’ll keep an eye out for or/ and try to eliminate in future fasts. Positive bias: Long time ketogenic/ high fat diet (5 years) which may mean I’m an outlier compared to the population with respect to switching to ketone metabolism. Positive bias: Creatine Monohydrate supplementation ongoing for most of the last 3 years with some breaks here and there. Last 3 months consistently. 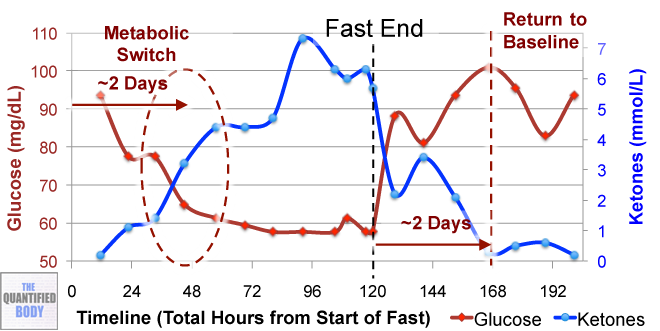 Could the 5 day break from creatine for the fast, then retaking in post 7 days have an impact? Doubtful that it would be this significant. Positive bias: Currently I have a low lean muscle mass compared to historic norm due to a large amount of muscle mass I lost the last 3 years (again infection driven). This could account for a greater increase for my personal situation as my health normalizes and may not be repeatable in future cycles. [?] bias: Diet change. I’ve increased the amount of resistant starch type 3 in my diet since just after Fast 1 and a few weeks before Fast 2. This means I am eating more carbs in my baseline diet. This did not change between beginning and end of the fast 2 testing period, but it is a longer term change. Positive bias: Adrenal Supports. I Have been taking adaptogenic herbs and adrenal complex since March 2015, theoretically this should have led to some improvement. Negative bias: There was a 3 day coffee roadtrip binge between Fast #1 and Fast #2 where I consumed 3 X coffees plus per day. A lot of fun but pretty irresponsible given my adrenal situation. This could be a greater factor in the negative results than the fasts. About the experience of the FMD itself – there’s not a lot to say beyond the fact that it felt much easier. None of the symptoms I experienced last time occurred. There were no headaches like last time. There was less dizzyness when getting up quickly. Also no skins rashes. I’m tempted to attribute this to the micronutrient support provided by the green’s powder the idea being that it provides the nutrients required for detoxification and liver processes amongst others, thus better dealing with a potential increase in toxic load from lipolysis (breaking down body fats which tend to store fat soluble toxins). Also I did more physically. On day 5, the last day of the fast, I went on a trip to London to a couple of labs to get blood labs and BodPod tests done. This wasn’t a big deal and I didn’t feel weak in doing so. This compared with the first time where on the 5th day the physical weakness was a lot more noticeable. Potentially on day 4 and day 5 I noticed my stomach a little more than with the water fast. In my first water fast I had pretty much dropped the issue of eating or being hungry. But with this time round, possibly because I was taking the green powder- I was more aware of my stomach, and a little grumble here and there. But it was marginal and not really uncomfortable. Just slightly different. Personally, I’m not 100% sure that all of these differences I’ve noted are absolutely physiological. Some of it could be put down to feeling a lot more comfortable in the fasted state due to having already done it before. I’d say some of it could be just me expanding my comfort zone and getting along with things while paying less attention to the fasted state. While I would love to continue the fasting cycles, and I would even feel comfortable doing it as a “life routine” given the upside benefits, for now I’m going to give it a break. The next few months I’m going to focus on adrenal recovery – with additional supports – to try to get that parameter moving in the right direction. 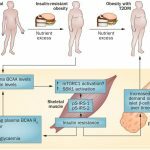 Metabolic adaptation: Will my time to switch to ketone metabolism get shorter the more fasting cycles I do? Lean Gains: Is it possible to continue to gain lean body mass with repeated FMD cycles? Full FMD: I imagine for my next FMD I’ll take the avocados too. This will help to make the fast safer as a reintroduction after working on my adrenals. Otherwise I’d like to know how the full FMD compares to my micronutrient only FMD. Have you done some kind of fasting before? What was your experience like? And what other types of fasting are you interested in learning about? Let me know in the comments. Blood Ketones (Beta-Hydroxybutyrate / β-hydroxybutyrate): Blood ketones are the gold standard for measuring your state of ketosis. During the fast, ketones are expected to peak in the range of between 6 and 7 mmol/L based on Seyfried’s work and experience. In episode 7 Jimmy Moore notes that values over 1.0 on your blood ketone monitor give you the benefits of ketosis, and there is no need to go over 2.0. Tim Ferriss also prefers this range, noting that his best mental performance is typically with values between 1.1 and 1.7 mmol/L. Blood Glucose (mg/dl): A measure of the level of glucose in the blood at one point in time. Dr. Seyfried’s therapies target reduction of blood glucose levels to limit cancer cell growth, and according to his theories high blood glucose is a biomarker of increased cancer risk. For the fast he notes values between 50mg/dL to 60mg/dL are standard. Non-fasting values should be below 80mg/dL ideally, and at least 92mg/dL. Weight (lbs, Kgs): Standard weighing scales measurement of weight in morning without clothes (to avoid biases). Lean Body Mass (lbs, Kg): Sum of weight of all non-body fat weight in the body. Calculated by combining your weight with a lean body mass % estimate. Body Fat (lbs, Kg): Total bodyfat weight for your body based on a calculation using your weight with a bodyfat % estimate. 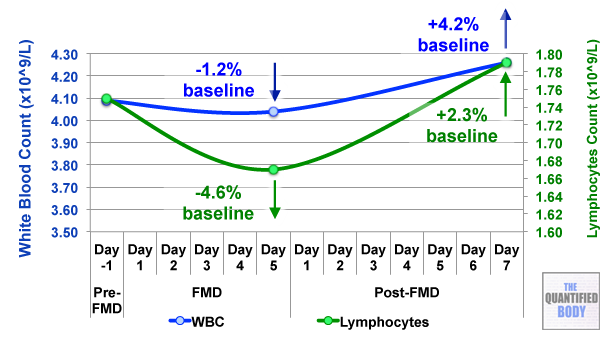 IGF-1 (Insulin-like Growth Factor 1): In caloric restriction and fasting IGF-1 drops, while consumption of high glycemic carbohydrates and protein spike IGF-1. Measured in ng/ml (or nmol/l in the UK). Normal ranges vary by age and gender (see reference here). More info on IGF-1 and its uses here. (Note: Damien’s baseline levels are 119 ng/ml, just below the “standard reference range” for his age group). WBC (White Blood Count): A count of white blood cells found in the blood, low levels can indicate immunosuppression, while high levels can indicate an existing infection with active immune response. Lymphocyte Count (White Blood Count): A count of white blood cells found in the blood, low levels can indicate immunosuppression, while high levels can indicate an existing infection with active immune response. Functional Adrenal Stress Profile (BioHealth 201): Damien uses this adrenal functional panel based on recommendations from practitioners and his physician on its higher sensitivity and accuracy to diagnose status of adrenal function compared to others on the market. Hematological Profile: Also known as Complete Blood Count (CBC). A standard test providing information on your blood cell breakdown including red blood cells, and white blood cells. Can be run with virtually any lab test company and is used routinely as a first screen by physicians and in hospitals for diagnosis. Ketonix: Damien used the “Ketonix Sport” during this experiment to compare the results with those of the blood ketone results. The results from the Ketonix did not correlate very well with the blood ketones measured – so we’ll be sticking to tracking blood ketones directly in future self-experiments. BodPod: An accurate approach to measuring your body composition and separating out your % lean body mass (muscle, organs, bone) vs. your body fat. You find BodPods in some high end gyms, but more often in fitness labs. Omron Body Composition Monitor: Used by Damien for his home weighing scales although he no longer uses the body composition functionality as he finds the bio-impedance technology used too variable. As noted in this experiment the weight metrics turned out to be a fair bit different to the BodPod more accurate standard also. Fast Mimicking Diet (FMD): Also known as the periodic fast mimicking diet, since studies to date have focused on using 3 to 4 cycles of 5 days on the diet each month. 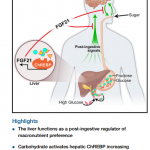 The main summary paper, “A Periodic Diet that Mimics Fasting Promotes Multi-System Regeneration, Enhanced Cognitive Performance, and Healthspan” was published in the Journal of Cell Metabolism in June 2015. HealthForce Greens Powder: The greens powder Damien used in the experiment. There are many greens powders on the market of varying quality. Another one he’s used in the past is Amazing Grass Greens Powder. Activated Charcoal: A broad spectrum binder used to bind to toxins in the gut and carry them out. There are high cost versions such as Activated Coconut Charcoal (potentially less contaminants) and lower cost versions such as this. If you buy others check the ingredients – they often have added sugar and other undesirables. Valter Longo: is director at the USC Longevity Institute. Fast Mimicking Diet study June 2015 and USC press/ news release. Dr. Thomas Seyfried: See episode 14 for more information and references to Dr. Thomas Seyfried’s work on fasting and cancer.